The answer might depend on who you ask. It’s generally accepted that cats become seniors when they’re anywhere between seven and ten years old. With cats now living longer than ever before, it’s becoming obvious that senior kitties can be fit, healthy, and energetic – and diet can play a part in helping your cat stay well as they age. Senior cats don’t necessarily need special foods designed for older cats. They just need high-quality nutrition that meets their unique needs. Protein is the cornerstone of every cat’s diet, and it’s doubly important for senior cats. As your cat ages and their ability to absorb nutrients and metabolize energy declines, high-quality protein content can mean the difference between a healthy, fit kitty and a skinny one. When cats reach 10-12 years of age, their calorie and protein needs increase. It becomes more and more difficult for them to maintain muscle mass – an estimated 50% of senior cats are underweight. A study on the effect of protein on lean muscle mass in adult cats gives us a clear picture of what cats need. Mark E. Peterson, DVM shares the results of that study in a piece called Don’t Let Your Senior Cat Become a Skinny Old Kitty:“In the first study, cats were fed three isocaloric diets with protein levels of 22%, 28% or 36% on a dry matter, or DM basis. In this study, the protein sources for these diets included poultry, soy, fish and crystalline amino acids to meet amino acid requirements. Only the cats on 36% DM protein were able to maintain their lean body mass, whereas the cats on the 28% and 22% protein diets lost lean body mass.”Again, protein content becomes ever more important when your cat enters their senior years. Unless that protein is highly digestible, however, it’s virtually worthless for your cat’s health. Feed your cat foods that use high-quality protein sources that honor your cat’s biological needs. Meat protein is highly digestible and nourishing for your cat – an obligate carnivore. Cats weren’t made to consume plants. Foods high in plant protein have only minimal digestibility. While the inclusion of plant proteins can pump up the protein percentages on the can, they don’t deliver the nourishment that your cat needs. 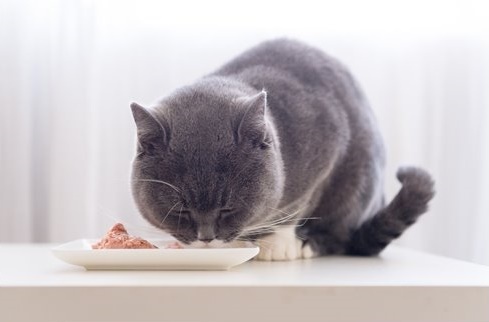 With renal failure the most common condition affecting senior cats, it’s important that we feed them a diet that can help keep their kidneys healthy. Water is the foundation for kidney health throughout life. Because cats don’t typically drink a lot of water on their own, it’s important to ensure that their food provides adequate moisture. The simplest way to do this is by feeding a raw or canned food, which both offer at least 70% water content. Secondly, metabolically stressful foods put an excess burden on your cat’s kidneys. 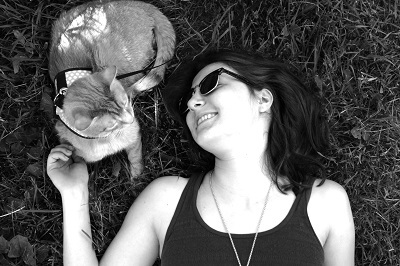 The best approach is to feed a diet that is easily assimilated by your cat’s body. Minimally processed meat, organs, and bones are the most biologically available food for your cat. The introduction of biologically inappropriate ingredients like grains, fruits, vegetables, and legumes places excess strain on the kidneys. Cats with renal problems should also be on a phosphorus-limited diet to help ease the burden on the kidneys. Foods high in phosphorus include dairy, organ meats, and fish. Low-phosphorus meats include rabbit and poultry. Because many cats lose their interest in food as they age, it’s important to stimulate their desire to eat. Warm, moist foods with strong aromas can point your cat in the right direction. A sprinkle of bonito flakes or a splash of bone broth can also encourage your older cat to get the food they need. Dental problems can make chewing a challenge, so it’s a good idea to select moist, soft foods that are easy for your cat to consume. After the metabolism slump of middle age, senior cats typically have higher calorie needs. A nutritionally dense diet made from high-quality ingredients is the best choice for your aging cat. A complete and balanced raw or homemade diet supplemented with probiotics can be a great choice. If you’re looking for a commercial food for your senior cat, the following list features a handful of the best products available on the market today. Each of the foods on this list was chosen with senior needs in mind: nourishing biologically appropriate animal protein, minimally processed ingredients, plenty of moisture, and a soft texture. This pate cat food has a soft texture that your senior cat can easily eat up. The food is based on real, protein-rich chicken, which helps to support continued muscle mass and overall health. It doesn’t contain any byproducts or fillers and is completely grain-free. It’s free from anything artificial like colors, flavors, and preservatives that could make your cat sick. With 92% fresh meat, organs, and bones, this canned cat food nourishes your senior cat in the way that nature intended. 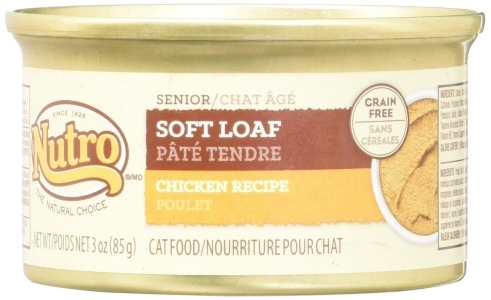 It comes in a chunky loaf that’s soft and easy to eat, plus rich in moisture to keep your cat’s entire system healthy. The food contains 3% green lipped mussel, which is a natural source of glucosamine and chondroitin – perfect for cats with joint problems. The recipe is free from plant proteins, byproducts, and fillers. All of the ingredients are carefully sourced from sustainable New Zealand farms and waters. 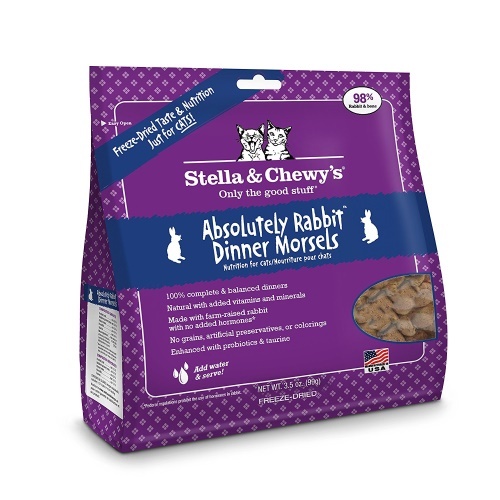 These freeze dried morsels give your cat the well-rounded nutritional value of raw food in a convenient, safe form. High-quality raw rabbit is nutrient-rich and packed with biologically available protein. The recipe also incorporates probiotics to support digestive and immune system health. When rehydrated with warm water, this is a moisture-rich, appetizing food that should excite your cat. The food is made in the United States and doesn’t include any ingredients from China. This canned cat food uses a single animal protein source, making it perfect for senior cats with allergies and food sensitivities. Rabbit meat is a biologically appropriate source of protein that’s also low in phosphorus. This simple recipe is free from anything that’s not a good fit in your obligate carnivore’s diet and doesn’t contain fillers, grains, or artificial ingredients. It’s high in moisture to support kidney and lower urinary tract health. This recipe is made in the United States from only high-quality US ingredients. This is a soft pate made with low-activity seniors in mind. The recipe starts with real high-protein chicken meat, chicken broth, and chicken liver, followed by a few plant ingredients and supplements. It contains Omega-3 and Omega-6 fatty acids to support a healthy skin and coat. While it is grain-free, this recipe does include unnecessary plant ingredients like carrots and sweet potatoes. The addition of dietary fiber can help some constipated older cats, but aside from fiber content, these ingredients have little to offer an obligate carnivore. With up to 78% moisture, this food helps to keep your cat healthy and hydrated. Hi I am not sure how long ago this article was published but I do have a question that I hope you can help with. Basically your article states that only the cats that were consuming a diet with a DM basis of 36% protein were able to sustain their weight. This is all new to me so I went online and did a little research and found a calculator which allows you to determine what the Dry Matter Basis is for any value listed on the label of cat food. What I discovered is that all the different brands I checked which I considered to be lesser quality cat food all had a DMB value of over 50% protein. Initially I assumed that the cat foods you are listing in the article would have the higher protein values and that the run of the mill brands would be much lower. So what I am asking is there another factor that I am not taking into consideration? I understand that the cat foods you suggest appear to very natural and probably are very healthy for my cat but the article made me believe that the higher protein levels is what is necessary to allow my older cat to maintain lean muscle mass and potentially not lose weight. 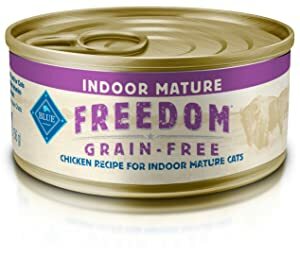 So in short since most every cat food brand I checked appears to have ample protein levels is there something I am missing say if I would compare lets say Fancy Feast pate to the Nutro Grain Free Soft Loaf which you list as the best food for an older cat that may be losing some weight? My situation is that I have a 13 1/2 year old male cat who isn’t very large ( usually averaged about 12lbs ) who has dropped about 2 lbs over the past couple of years. I had him checked out by the vet and all bloodwork, stool, and diagnostics indicated that there isn’t an apparent underlying condition. My cat is a very active indoor/outdoor cat and sometimes supplements his diet with field mice ( we live in the country ). So basically my wife and I thought that the protein levels in his current food may not be sufficient after reading your article but after using the calculator it appears the levels are adequate. The biggest difference between Fancy Feast and Nutro is digestibility. Both have 50% or more protein on a dry matter basis, but some of the Fancy Feast protein is from meat by-products and therefore a slurry of organs, muscle meat, and indigestible tissues, so we don’t exactly know how biologically available that protein is. As for the 36% protein number, the cats in the study were relatively sedentary young adults. As cats get older, their protein requirements progressively increase. While the cats in the study needed about 28 grams of protein a day, a 12-lb senior cat might need 44 grams or more. And considering that your cat is an active country dweller, his ideal numbers could be even higher. Remember that part of being an obligate carnivore is the fact that cats can’t stop metabolizing protein when they aren’t getting enough in their food. They will instead cannibalize themselves from the inside out, and that’s what happens when a senior cat’s increased protein requirements aren’t met by increased levels of digestible protein. Bottom line: between your cat’s active lifestyle, his age, and the digestibility of his food, he might not be getting enough protein despite a healthy percentage on the label. Properly prepared raw meals are the most bioavailable source of protein, followed by meat-heavy cooked foods like the ones in this article. Avoid animal by-products and plant protein like corn gluten meal, pea protein, and dried alfalfa meal. All About Cats can you please share the protein calculator you use to determine the DM in cat foods based on food labels? Thanks. It’s really easy to use. Just enter the nutrient value and the food’s moisture percentage and the calculator will return the given nutrient’s dry matter value. If you’re ever caught without the calculator and need to calculate DM values on your own, remember that all we’re doing is removing water. Subtract the moisture percentage from 100%, then divide the nutrient value by the resulting percentage to get the dry matter value. The formula looks like this: % Nutrient Value / (100% – % Moisture). How do you find the nutrient value? The minimum or maximum percentages of protein, fat, and some other nutrients will be listed in the guaranteed analysis on the label or in the product listing. You’ll see that the food is, for example, 46% fat (minimum). This means it’s at least 46% fat. You can base your calculations on this minimum number or refer to a typical analysis. The typical analysis is not always available on the cat food container, but you can usually get it from the company’s website. If it’s not published on the site, get it from their customer support department. The typical analysis is based on testing of multiple batches and gives you an average percentage rather than the minimum or maximum amount of each nutrient. If you’re interested in a nutrient that’s not listed on the label—calcium, for example—, you may have to refer to the company’s website. If it’s not listed somewhere on the site, contact the company and they should be willing to provide that information to you directly. I want to try these foods, but don’t want to buy a case of any in case my cat doesn’t like the taste. Can these brands be found anywhere else in small quantities? 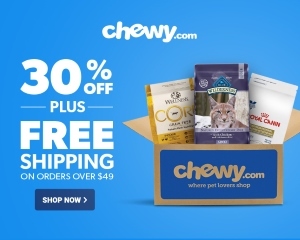 Most of the above-listed products are in stock on Chewy.com. They have a very friendly return policy and offer free returns for any product, used or unused, up to one year after purchase. If your cat tries their first can and doesn’t like it, Chewy will let you return the case for free. There are also a few online retailers who offer single cans of cat food. 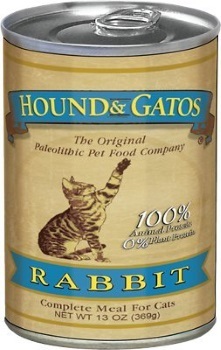 OnlyNaturalPet, for example, has individual cans of the above-listed Hound & Gatos and ZiwiPeak canned food in stock. Otherwise, don’t hesitate to contact the companies directly. Many cat food companies are willing to send small samples for free or at a discounted price. You didn’t mention lamb or turkey. Is this not good for senior cats? Good eye! Turkey and lamb are perfectly fine for senior cats—we just didn’t happen to mention any lamb or turkey-based foods on this particular list. Hi, are you a vet? If not could you please indicate as such at the start of articles you write pertaining to animal health? There are some questionable pieces of advice on here regarding protein demands for senior cats, and your readers deserve to know that the author’s credentials regarding such an important topic. Thanks. None of the articles on this site should be considered a replacement for veterinary advice and that’s now disclosed at the bottom of the article. Many of the site’s other articles on health subjects also acknowledge that fact at the top of the piece. To answer your question—nope, I’m not a vet. I hope no one assumes that any blog article on animal health is written by a veterinarian. Most aren’t! You could argue that this fact is fueling the spread of misinformation or misconceptions, but I believe it’s making us savvier readers. Instead of assuming that only experts can write about sensitive topics, we know not to trust anyone blindly, whether they have credentials or not. We do deeper research to find the truth. I’d prefer that people think of these articles like a conversation with a non-credentialed but relatively well-read friend. Take them with a grain of salt. I include reputable sources and references whenever possible to help research-inclined readers to go deeper and reach their own conclusions. Ziwi venison lists chickpeas as the 5th ingredient…. Isn’t that a vege? LK, thanks for pointing that out. You’re 100% right. Though the food is primarily made from meat and organs, it does contain a small amount of chickpeas and other plant-sourced ingredients. 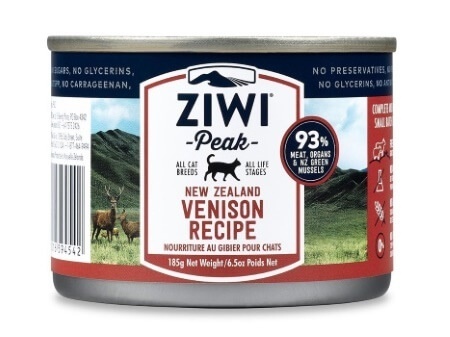 Like most cat food companies, ZiwiPeak doesn’t disclose how much of the food’s protein content is from animal sources, but it’s likely that a percentage is from chickpeas.